A seminar on “Religious Communities for Justice and Peace” took place in the capital of Russia on 11 March 2013. Taking part in the seminar were representatives of the Russian Orthodox Church, World Council of Churches, Evangelical Church in Germany, the National Council of Churches in Korea, Protestant communities of Russia, as well as scholars, cultural figures, and foreign guests. Metropolitan Hilarion of Volokolamsk, chairman of the Moscow Patriarchate’s Department for External Church Relations, greeted the participants in the seminar, saying that in the “Bases of the Social Concept of the Russian Orthodox Church” it insisted on equitable distribution of the products of work and considered the topic of justice in the social and political processes. “The Russian Orthodox Church maintains constructive cooperation and dialogue with governmental structures and civil society on the problems of justice and peace,” Metropolitan Hilarion continued to say. He expressed his hope for the upcoming 10th Assembly ‘to pay special attention to discrimination against Christians and will be explicit in its support of the persecuted. The DECR chairman believes that the situation in Syria will be thoroughly considered by the Assembly and that the WCC will second efforts made by the international community for peaceful settlement of the conflict in Syria. His Eminence gave his blessing to the participants in the “Peace Train’ project. Revd. Dr. Young Ju Kim, general secretary of the National Council of Churches in Korea, spoke about the lasting lack of confidence between people of North and South Korea. ‘At the Assembly, we will call for the reunification in the Korean peninsula,’ he said and invited the Russian Orthodox Church to take part in the process. Dr. Guillermo Kerber, the WCC’s programme executive on Care for Creation and Climate Justice, greeted the participant on behalf of the Revd. Olav Fykse Tveit, WCC secretary general, and thanked the organizers of the “Peace Train” and the seminar, especially His Holiness Patriarch Kirill of Moscow and All Russia and Revd. Dr. Young Ju Kim, for an opportunity made for Christians from different countries to meet and exchange experience. 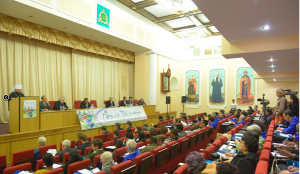 “Peace Train” was sponsored by the National Council of the Churches in Korea, and the seminar – by the Moscow Patriarchate’s Department for External Church Relations (DECR), which was represented by archpriest Dimitry Sizonenko, DECR secretary for inter-Christian relations, Ms Margarita Nelyubova, DERC staff member, and archpriest Sergy Zvonarev, DECR secretary for far abroad countries, who acted as moderator of the seminar.